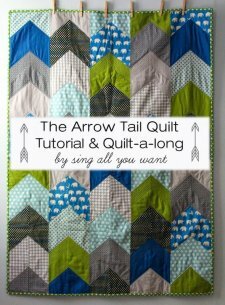 "Woohoo, I'm so happy that some folks have let me know that they are looking forward to a tutorial and quilt along for the quilt formerly known as Dillon's Quilt! You may have noticed that I gave this quilt a real name. Poor Dillon...I did not want his name forever tied to this design, so I've decided to call it the "Arrow Tail Quilt" since the shapes resemble arrow tails. "I have updated and verified to the best of my abilities the supplies for a baby size and twin size quilt. If you are interested in some other size, I think that it will be fairly obvious how to downsize or upsize this pattern once you get going."